﻿ River Kwai Resotel Resort, Kanchanaburi | FROM $33 - SAVE ON AGODA! Have a question for River Kwai Resotel Resort? "Recommend for people who want private and keep out from the outside." "Staff were pleasant and the buffet breakfast was good." "Quite area good for getting away from the busy city." "This is one of the best experience as the hotel also provide..."
River Kwai Resotel Resort offers modern residential comfort amidst unspoiled nature on the banks of the Kwai Noi River. The resort is well-secluded and tucked away in the middle of beautiful mountains and perched directly on the riverbanks. Ideal for a romantic getaway or a quiet break from the city, the resort is only accessible by boat. The thatched roof chalets are clean, comfortable, and spacious, boasting all the modern amenities of a 3.5-star hotel. There are plenty of activities you can do in surrounding areas, including visiting the Elephant Park, the Tiger Temple, the Mon tribe village, the Erawan waterfall and, of course, the world famous River Kwai Bridge. Mountain biking around the resort after sunset will complete your experience at the River Kwai Resotel Resort. 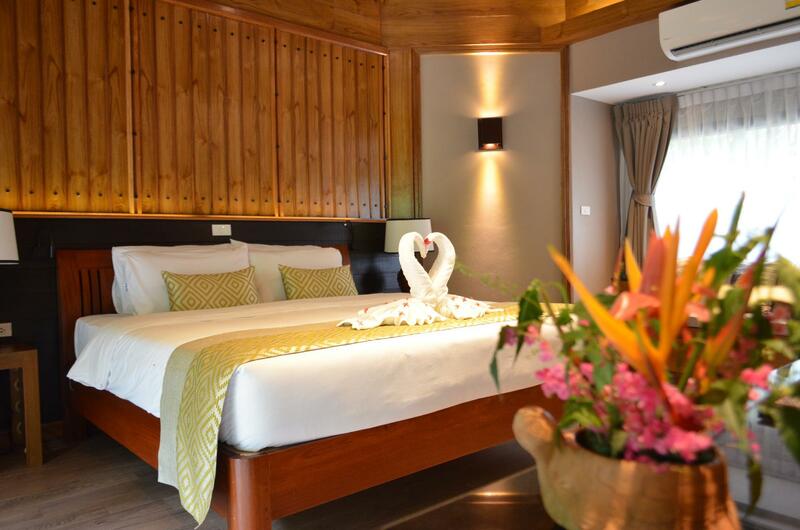 Making a booking at River Kwai Resotel Resort is easy with our secure online form. Just enter your dates and click. "Too far from main road but, excellent view and great room." Boat transfer service from Putakian Pier is available every 30 minutes on following arrival time 01:00 PM to 06:00 PM and departure time 08:00 AM to 12:00 PM. For travelling outside mentioned hours, please contact hotel directly. Love this resort - it was a bit hard to find (we were on a motorbike) but when we got there it was worth the search. I'm impressed with this hotel's location and hospitality. First of all, the staff are friendly and helpful, most of them can communicate in English well. Secondly the location is great, river view, it's so peaceful and beautiful. The only thing can be a problem is this resort is located deep inside the national park, you must drive quite long way to reach there. Finally, the food is amazing, both buffet and A La Carte, it's delicious. I will choose this resort if I have chance to come back to Kanchanaburi next time. Highly recommended this resort to everyone. Very nice area of river Kwai and charming hotel! Food was good only down point for us bikes where under maintance and we couldn’t rent two of them. I reccomend own transportation. Great stay we will be back. It was not easy to find it... GPS didn't help so much, but in the end, it became a wonderful surprise! The perfect place to enjoy nature, in nice facilities, good food, and peaceful place. To revisit for sure, now with more time to benefit from all the environment! Spent some of our honeymoon here in 2009 and came back to check it out. Now has road access. Great hotel with fantastic friendly staff. Rooms spotless and with all the facilities you could need. Nice pool and restaurant bar area. Jungle sounds at night are fabulous, a real feel of being in the jungle whilst staying in nice accomodation. I would grade 10/10 for the product received compared to the price! Great location, super green and relax, nice staffs, beautiful room. We had a chalet with a spacious private jacuzzi and loved it! Interesting boat ride to the resort, front desk organized and prepared for arrivals, rooms nice and clean, and the overall facility is well maintained. Not that much to do — but the bar by the pool serves drinks, the pool is nice, and there is a Thai dance show in the evening . . . Would definitely return . . .
We are architects, so we love their buildings and tropical garden so much. We also got upgraded to the newly decorated room which is very clean and comfy. The hotel is sit in the forrest, up and down hill, so it might be difficult to travel around, if you have no vehicle, especially at night. We have a car but we decided to stay there for dinner and the food was fine. After reading a few negative reviews here I arrived with slight trepidation. I have stayed in other similar jungle chalets before and know a few of the problems some people mentioned. However... i found none of thise problems here myself. Staff were very friendly and very helpful and pleasant and the room i had .. 608 was really beautiful. It was spotlessly clean and freshly smelling. Aircon was very cool and everytbing was as it should be. The grounds of the hotel are beautifully kept and the nature is stunning. A few renovation works were underway at the time of our stay and probably the reason we got a fantastic deal on the price. These didnf pose any prblems to me at all during my stay. Food was very good.. plenty of choice and buffet breakfast was plentiful. I recommend a walk through the grounds to the float house sister for lunch by the river. All in all a great place to visit and i will be returning on my next visit to tbe area. The resort is hidden away and not readily accessable, transport needed to visit local attractions or use the hotels river transport. Food very good and staff are very attentative. Restaurant closes at9pm and the bar at 10pm Pool is small but very clean, all the rooms are well siyuated and privacy is provided. The hotels organises the popular attraction visits. A very enjoyable stay, and would return. The resort is located beside the river in deep forest, so it’s a heaven for true natural lovers but too far in distance on lonely rural road by car. The resort’s facilities are full option. The room is not quite clean. Resort’s restaurant has all high cost menus. No internet signal and resort’s wifi is out of order. The staffs at reception are not quite friendly and helpful. At last, if you come by car, the car park is very far from the room and you have to walk with your staff carrying by yourself!!! It was really nice I wish I could stay a little bit longer. Also the bolognese was GREAT! quite area good for getting away from the busy city. A bit too far from the main road if driving into the resort area. However, the resort offer the free tote ride from the other pier on the opposite site and car park at the pier. More locals here than tourists. Weekends rather busy, weekdays are very quiet. Google does not recognize the road this resort is on - it will take you to a street after or before- watch out for the sign. Nice place to feel connected to nature. great place if you have a car, you might find it too remote if you haven't. in house tours are relatively expensive. a very quite and peaceful place. food was delicious, beer too expensive. but saying that we would stay again, if we had a car. Superb value for money. We had a double house (to get 4 beds) with shared terrace with river view. Nice pool area with places both with sun and shadow at noon time. Good food selection with a-la-carte and buffet. Free parking for the car. A bit far from the main road (no. 323), but that is the price for staying directly at the river on the western bank.